Overview - An 11-year-old boy has his life changed forever when he befriends the class outsider, a girl. Together they create the world of Terabithia, an imaginary kingdom filled with giants, trolls and other magical beings. Based on the prize-winning young adult novel of the same name by Katherine Paterson, 'Bridge to Terabithia' tells the tale of fast friends Jess Aarons (Josh Hutcherson) and Leslie Burke (AnnaSophia Robb). Jess has been bullied at school and misunderstood at home, so new girl in town Leslie brings him into the woods to open his mind to the amazing, imaginary kingdom of Terabithia -- a secret land where the two pre-teens reign supreme among the giants, ogres and other fantastical creatures they create. But Terabithia has plenty of lessons to teach about real-life, too, including some unexpectedly painful ones that Jess will carry with him for the rest of his life. One of the many things I found so refreshing and pleasurable about 'Bridge to Terabithia' is that, for once, the fantasy is entirely in the minds of the teen protagonists. Rather than telling yet another story about children stuck in oppressive environments who discover a doorway to a fantastical world, here we have ordinary, everyday kids who manage to create the magical out of the mundane themselves. It's an adventure not about stunted immaturity, but the accepting of responsibility -- instead of merely retreating into juvenile silliness, these teens have the far more demanding task of making their world a better place. That makes 'Terabithia' much more low-key (if no less effects-heavy) than large-scale filmed epics like 'Narnia' or 'Eragon,' but arguably far more relatable and inspiring. The film also happily doesn't revel in so many of the cliches that usually haunt these types of fantasy films. The adults are not all stupid or evil, an even the teachers (usually played as buffoons or abusive tyrants) are positive and encouraging. It may very well be hokey to kids, but it's nice to see a depiction of a world where learning is, well, fun. Even more shocking (especially given the conservative right's championing of Disney's recent 'Chronicles of Narnia'), 'Terabithia' makes the brave step of letting Leslie question not just authority, but religious extremism, as well. This is done in a forthright way that's hardly subtle, yet is thankfully free of any disparagement of any particular faith. At last -- fantasy filmmaking freed of dogma and doctrine! All politics aside, 'Bridge to Terabithia' would not be effective if its two young stars were not well cast, and Hutcherson and Robb are indeed real finds. Pretty without being precocious, and smart without being smug, both actors bring a depth to their characters that suggests a talent beyond their years. Robb is especially vibrant, radiating the kind of strength and charisma of a young Winona Ryder, Jenna Malone or Lindsay Lohan (pre-rehab). She's definitely one to watch. In the end, perhaps there's no secret why a movie like 'Bridge to Terabithia' works so well. It simply remembers what it's like to be a kid -- when the world was still huge and full of promise -- but it does so without any condescension or vulgarity. Add to that a story that's deeper than expected, some memorable characters and some enjoyable special effects, and you've got a winner of a family film that truly earns the label. 'Bridge to Terabithia' comes to Blu-ray day-and-date with the standard-def DVD release, and both share the same high-def master. While this 1080p/AVC MPEG-4 transfer looks quite good, I thought it could have been even more effective had it been less processed. Typical of many new releases, the master has been so post-produced that it often veers towards the artificial. The source is impeccable, of course, with nary a blemish to be found, but contrast runs a bit too hot, which bolsters depth to the image at the expense of realism. Colors are fairly vibrant, but some hues (particularly oranges and greens) look over-saturated, giving fleshtones a waxy look that only shines in close-ups. On the plus side, detail is quite strong, blacks are nice and solid, and there are no compression issues. Make no mistake: overall, 'Bridge to Terabithia' looks very good -- it's just that with a few improvements this one could have truly been an A+. No major complaints about the audio. This uncompressed PCM 5.1 surround track (encoded at a beefy 48kHz/24-bit/6.9mpbs) is very strong, with a lively presence that truly lights up the film's fantasy sequences. 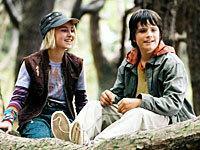 'Bridge to Terabithia' alternates between reality and fantasy, so the soundtrack predictably follows suit. The fantastical scenes are aggressive and immersive -- surrounds are active with all manner of discrete effects and nice, seamless pans. Conversely, dialogue scenes are front-heavy, but still nicely recorded. Dialogue holds firm throughout, which is a particular benefit in a movie with so many child performers, who can often be hard to understand. The sweet (if slightly generic) score by Aaron Zigman is also nicely spread out to all channels, which gives a nice, swelling feel to the rears. Dynamics are also very good, with deep low bass and clean highs. Hitting Blu-ray day-and-date the standard-def DVD, both editions contain identical supplements, although strangely the back of the Blu-ray box only lists a couple of featurettes and a music video as supplements (and not the two audio commentaries). First up are the two featurettes. Neither truly elevates the form, but the overall content and quality is a cut above the usual EPK fare. "Behind the Book: The themes of Bridge To Terabithia" runs almost 15 minutes and is a love-fest for author Katherine Paterson. A slew of librarians and other educators praise the book's themes, while a few cast members (including Josh Hutcherson, AnnaSophia Robb and Zooey Deschanel) recall their own inspirational experiences with the novel. Paterson herself, however, comes off best, recalling the moving real-life story that inspired the story's final act. "Digital Imagination: Bringing Bridge To Terabithia to Life" tackles the film's special effects. At only 6 minutes, this one's less successful, although as Paterson herself notes, key to the appeal of the story is that the fantasy is in the mind of the protagonists, so for once less really is more. Next we have those two "secret" audio commentaries. The first features director Gabor Csupso, screenwriter Jeff Stockwell and producer Hal Lieberman, while the second sees producer Lauren Levine joined by young actors Josh Hutcherson and AnnaSophia Robb. Both are above-average tracks, filled with info and participants that genuinely seem like they want to be there. The actor track is a particular treat, as it is rare to find such young performers doing a commentary, even if their comments are more light-hearted and far less technical. Granted, only diehard fans of the film will want to listen to either, but given the quality of these tracks it really is surprising that Disney isn't doing a better job of promoting them. Rounding out the package is a Music Video for star AnnaSophia Robb's "Keep Your Mind Wide Open." It's cute, though judging by the amount of vocal processing I wouldn't be surprised if Robb never actually sang a note of the song. In any case, the music video is the only video extra presented in 480i/MPEG-2 video -- the rest are all full 1080p/VC-1 encodes. 'Bridge to Terabithia' surprised me. I wasn't at all familiar with the book, but I found this to be an enchanting, moving and magical little movie. This Blu-ray is also quite nice, with a solid transfer, a great soundtrack and nice batch of supplements, making it an easy recommend.